2014 Can-Am Maverick MAX X rs DPS 1000R, 2014 Can-Am® Maverick MAX 1000R X® rs DPS Get a side-by-side vehicle that turns heads for how it rides, and how it looks. Featuring breakthrough power, FOX PODIUM X Performance RC2.5 HPG Piggyback shocks, 12-in aluminum beadlock wheels, and X rs package trim. Plus, the added control of Tri-Mode Dynamic Power Steering (DPS ) and Visco-Lok QE auto-locking front differential give the ultimate off-road ride. STANDARD FEATURES MAY INCLUDE: INDUSTRY-LEADING PERFORMANCE Lead the pack with a 101-hp Rotax® 1000R V-Twin engine, featuring state-of-the-art high-flow dynamics. The sound of dual exhausts will soon be your signature. MOST POWERFUL The 976cc, 101-hp Rotax® 1000R V-Twin engine is Can-Am's most powerful side-by-side engine. This liquid-cooled, single-overhead-cam power plant features four valves per cylinder and is fed by a 54mm Bosch8 throttle body and two sophisticated VDO Siemens8 fuel injectors. BETTER THROTTLE CONTROL This electronic throttle-by-wire system works in conjunction with the 54mm Bosch8 throttle body to produce smooth delivery, even if the driver's foot is bouncing due to rough terrain. The iTC system detects unwanted bounces and filters the input. Comes with a progressive and sport mode. MORE POWER When an engine breathes easier, it can produce more horsepower. So we optimized air intake, combustion and exhaust flow. Larger intake plenum, high-flow heads, larger valves, increased compression ratio and high-flow dual exhaust all contribute to this more powerful and efficient engine. PRECISION-ENGINEERED HANDLING Get ahead of the competition on the spec sheet and behind the wheel. Tri-mode Dynamic Power Steering (DPS) electronically provides three selectable levels of steering assistance, ensuring the smoothest and most exhilarating ride for all passengers. INNOVATIVE REAR SUSPENSION The innovative Torsional Trailing A-arms (TTA) rear suspension is a compact version of a five-link suspension for no-bump steer, and the lowest scrub for optimized bump absorption and tire-to-ground contact. Features a lower unsprung weight and 14 in of travel. CENTRALIZED WEIGHT Other sport side-by-sides feature engines toward the rear, increasing inertia and tendency to oversteer. The Maverick engine is centered between the two seats, centralizing weight for more agile steering and easier cornering. The result is a nimble Maverick that is confident, powerful, and dynamic. RIDER-FOCUSED DESIGN Equipped with an analog / digital gauge, custom steering wheel, and eye-catching X-package items, the Maverick MAX X rs DPS is the perfect combination of style, comfort, and performance. COMFORT FOR FOUR The four-person Maverick MAX gives you ample seating to accommodate your passengers, thanks to its 113. 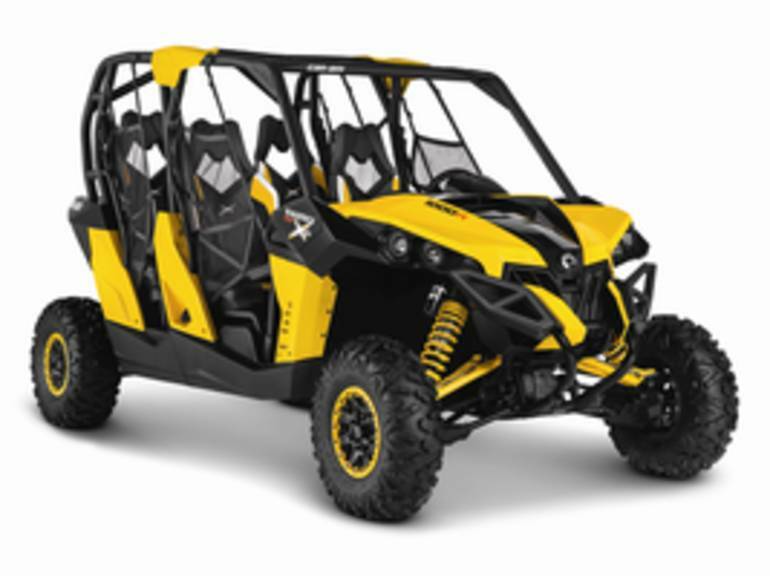 All Can-Am pictures are kind of Can-Am HD motorcycles picture was taken, including motor fuel gauge, engine, engine mounts, tires, fuel tank, the car handles, lights and so on, 2014 Can-Am Maverick MAX X rs DPS 1000R UTV/Utility full-screen viewing,2014 Can-Am Motorcycles today Price: $18,662.